This paper aims at studying the effect of Mn2+ in MnxZn1−xFe2O4 (x = 0.3, 0.4, 0.5, 0.6, 0.7) ferrite nanoparticles (NPs) and ferrofluid (FF) prepared by chemical coprecipitation method. Structural studies were carried out using X-ray diffraction, fourier transform infra-red spectroscopy and morphological using high-resolution transmission electron microscopy. 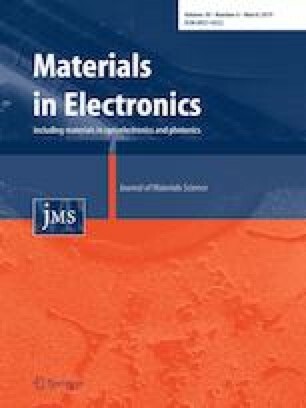 A vibrating sample magnetometer and electron paramagnetic resonance were employed to study the magnetic properties of prepared samples. It was observed that with increase in Mn content from x = 0.3 to 0.7, maximum magnetization showed increasing trend from 29.24 to 46.66 emu/g (at 2 T) with coercivity and retentivity almost equals to zero and Curie temperature from 380 to 522 K. A practical design of self-regulating cooling device has been constructed employing the synthesized FF as coolant. The device makes use of the dissipated heat and magnet to regulate the fluid flow in the loop exploiting the thermo-magnetic property of FF and transferring heat from heat load to sink. The device is self-powered, self-cooling, inexpensive and easy to maintain. By means of experiments performed, role of temperature of heat load, volume fraction of NPs and magnetic field strength has also been investigated and discussed.